Wintertime in Colorado is not only synonymous with downhill skiing. In fact, locals and seasoned travelers understand that the winter solstice renders the ideal conditions for exploring public parks. Trade in your summer hiking boots for snowshoes, cross-country skis or snowmobiles and experience Colorado’s state and national parks in the winter. You can hardly go wrong when choosing a winter activ­ity within the massive confines of Rocky Mountain Na­tional Park, but snowshoeing is popular here for a few reasons: It’s easy for anyone to get the hang of, rentals are a breeze in gateway towns of Estes Park or Grand Lake, and it allows you to tread lightly through Mother Nature without overly demanding athletic distractions. The Gem Lake trail (1.6 miles) is a favorite among locals and boasts 1.8 billion-year-old granite high-rise walls and views of the Continental Divide. Insider Tip: RMNP offers some the best ranger-led snowshoe programs in the state. Two-hour excursions begin at both the west (Grand Lake) and east (Estes Park) entrances January through March. Can’t pinpoint a winter activity that pleases every out­spoken family member? Mueller State Park, 40 minutes outside of Colorado Springs, has you covered with sledding, plenty of snowshoe and cross-country skiing trails and cozy winter cabins with modern amenities for those who prefer to celebrate winter by snuggling up next to a fire with a good book. And Cheyenne Mountain State Park, just 15 minutes south of town, offers an archery range, junior ranger program and geocaching to fill a winter's day. Insider Tip: The affordable cabins at Mueller are exceptional when it comes to amenities, space, scenery and overall comfort. Give yourself plenty of leeway for reservations (available online or via phone at 800-678-2267). The winter landscape grants some of the best op­portunities to watch mammals in their natural habi­tat. State Forest State Park, just east of Walden, is home to more than 600 moose that roam the park’s enormous 71,000 acres. But first things first: Stop by the Moose Visitor Center to get the inside scoop on where to watch these magnificent creatures. Insider Tip: Snowmobiling through the park is a favorite for adrenaline junkies and free spirits. You’ll gain more ground (70 miles of trail in addition to access to Routt National Forest) and take advan­tage of picturesque terrain that’s buttressed by the Medicine Bow and Never Summer mountain ranges. When many people think of Great Sand Dunes they think of a desert-like landscape. After all, the park boasts a whopping 30 square miles of sand dunes reaching heights up to 750 feet. The vastness feels even more visceral in winter with cooler temps, fewer visitors and the treasurable quietness that a fresh blanket of snow affords. But a real treat is when the famous Zapata Falls, just 11 miles outside of the park, freezes into a 25-foot icy monument worthy of the White Witch’s castle in Narnia. Insider Tip: Bring shoes that are suitable for hiking on ice. Nearby outdoor retailers sell affordable cram­pons that slip right over your hiking or snow boots for optimal stability. Another bonus to winter in Colorado’s national parks is that cars are prohibited from mucking up trails primed for cross-country pioneers. 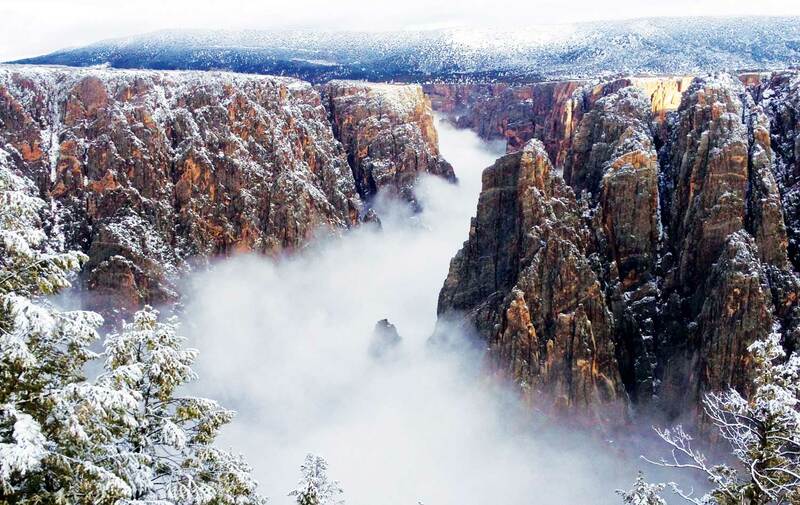 This is certainly the case for one of the state’s most popular trails, South Rim Drive (7 miles), which swishes Nordic skiers and snow­shoers to staggering views of Gunnison’s snow-dusted “black” rock walls. Rent skis in Gunnison or Montrose and park at the South Rim Visitor Center. Insider Tip: A few times a year the ranger program offers guided full-moon trips. If you think the canyon looks impressive during the day, just imagine those sheer rock faces under a moon­light beam. If the date’s not right, check out the ranger program’s stargazing and snowshoe tours. Coloradans don’t give up their favorite pursuits in the winter — they just have to switch them up a bit! How often do you get to spend quality time with your closest friends in a homely hut swapping stories and sippin’ beer? Amid all those good times, don’t forget about reeling in fleshy kokanee, trout and pike. Out-of-towners or newbies can visit 11 Mile Marina for equipment rentals or guided trips. Insider Tip: Eleven Mile State Park is roughly one hour away from two of Colorado’s most popular destinations: Breckenridge and Colorado Springs. Make a weekend of your ice-fishing excursion and poke around these hot spots or meander your way into Park County’s lesser-known, but equally en­joyable, towns like Lake George or Alma to experience mountain-town hospitality at its finest. Sylvan Lake State Park is arguably one of Colorado’s best-kept secrets for win­ter. Although Sylvan is located in the Vail Valley, a world-famous locale for skiers and snowboarders, it chooses to take a different spin on winter sans chairlifts and superpipes. Instead, visitors hit a jackpot of snow conditions, isolation and pure wilderness that yields an ar­ray of activities such as cross-country skiing, snowshoeing (rentals available at the visitor center), snowmobiling, ice fishing, sledding, wildlife watching and winter camping. Insider Tip: Sylvan also grants access to White River National Forest’s vast landscape and trail system acces­sible via snowshoes, cross-country skies or snowmobiles. Ridgway State Park's three yurts are found on the park's Dakota Terraces, where mountain views are indescribable and the potential for coziness abounds. The round, tent-like structures can be rented for two nights at a time and are warmed by a propane heater/gas log stove. Perfect for those not looking to get too hale and hardy for winter camping, a year-round restroom with flush toilets and sinks is also close by, and bunks, futons, a couch, table and chairs, microwave and refrigerator, electrical outlets and lights make things nice and comfortable. Insider Tip: The park recommends visitors bring their own bedding (ie, typically a sleeping bag), camping-style cooking supplies and eating utensils. Pets are allowed in one of the yurts for a fee.